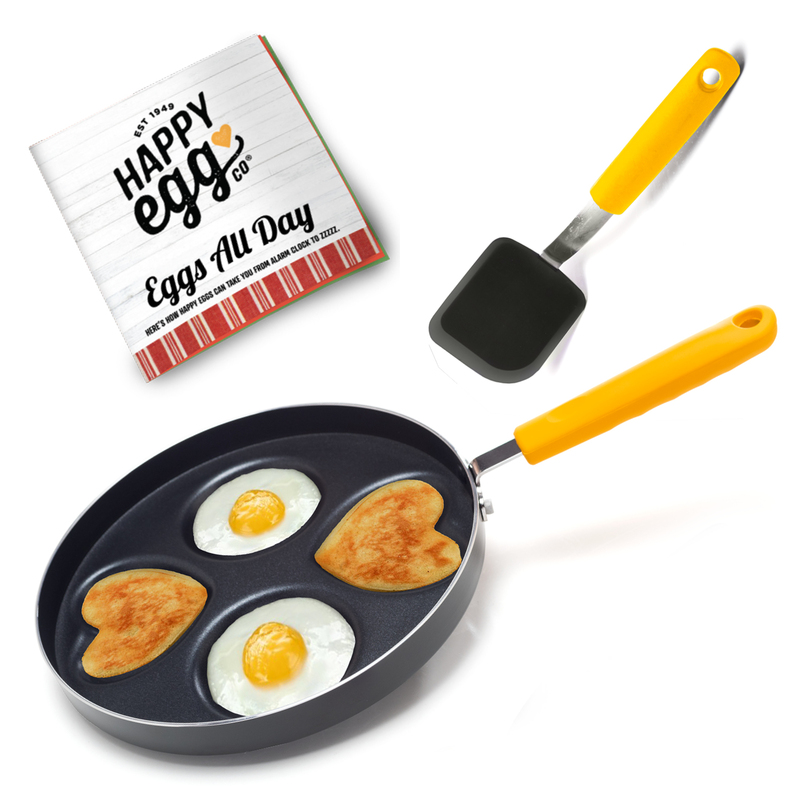 Add a little extra love to your pancakes and eggs with our hearts and circles egg pan. We include a specially designed spatula and a Happy Egg Co. booklet full of recipes and more! START YOUR DAY HAPPY – Make perfectly sized silver dollar pancakes or eggs in heart and circle shapes with our versatile frying pan. BETTER THAN MESSY EGG RINGS - Pan includes spatula designed to fit the cup for easy flipping and uniform cooking – try it for omelets, blintzes, or to construct the perfect egg sandwich. NON STICK COATED HEAVY DUTY ALUMINUM SKILLET – Coating contains no PFOA, lead or cadmium and is recyclable. Compatible with gas, coil electric, ceramic and halogen stovetops. EXCLUSIVE BOOKLET OF RECIPES & MORE - Eggs All Day has lunch, dinner and breakfast recipes, fun facts and information about how to select great tasting, ethically raised eggs. FUN SHAPES YOUR FAMILY WILL LOVE - Hearts aren't just for Valentines Day. Use this egg and pancake pan to serve up quick meals from your cooktop and get the kids cooking with you!